"One last cast". That's what my uncle Bruce would say when we were out fishing on his boat. That one sentence symbolized his passion for fishing as well as a desire to always keep trying. Sometimes, we would make 20 "last casts". And guess what? During those last casts, we sometimes even caught a fish! Trying just that let us achieve our goal. In photography, too, pushing just a little harder or staying right up until you need to leave is always worthwhile. When I created this image, I had already spent a week in the Adirondacks and to be completely honest, I was exhausted! I was contemplating leaving the night before, but decided to stick around for one for morning. Boy, am I glad that I did. While overlooking this lovely stream meandering through a marsh, leading eventually towards the High Peaks themselves, the sky lit up with gorgeous rays of warm light. Next time you are out on a trip and want to call it quits, try to remember this lesson for yourselves. It isn't always easy, but it's always worth it. Make one last cast. "Weary Eyes, Opened Wide" - Sunrise over a marsh overlooking the High Peaks. Adirondack Park, New York. Techs: Canon 50D, Canon 10-22 @ 19mm. 1 second, f/11, ISO 100. Polarizer. Tripod. Is it bad to constantly fall back on themes we've done before? Is my Great Falls portfolio a gimmick that I've stuck with for so long? A small bird. A big landscape. I don't know, but I'm so happy with the look of this image. Welcome to the mind of this particular artist. Adrift in a sea of thoughts. "Adrift" - A small bird in a big landscape. Great Falls National Park, Virginia. Techs: Canon 7D, Canon 400 f/5.6. 1/5th second, f/13, ISO 100. Polarizer. Tripod. It's funny, after years of creating images of great blue herons surrounded by water blurring by in a surreal landscape, I finally went to Great Falls with the intention of capturing the behavior of the herons. I truly believe there is a lifetime of possibilities when it comes to capturing herons in different locations with different compositions using my signature slow shutter speed technique, so I never had the desire to try to capture different types of photographs of them. Despite that fact, I had a ton of fun trying to get images of the herons fighting, fishing, and flying. I'll definitely be trying for some more images like this. It's good to change things up every once in a while! 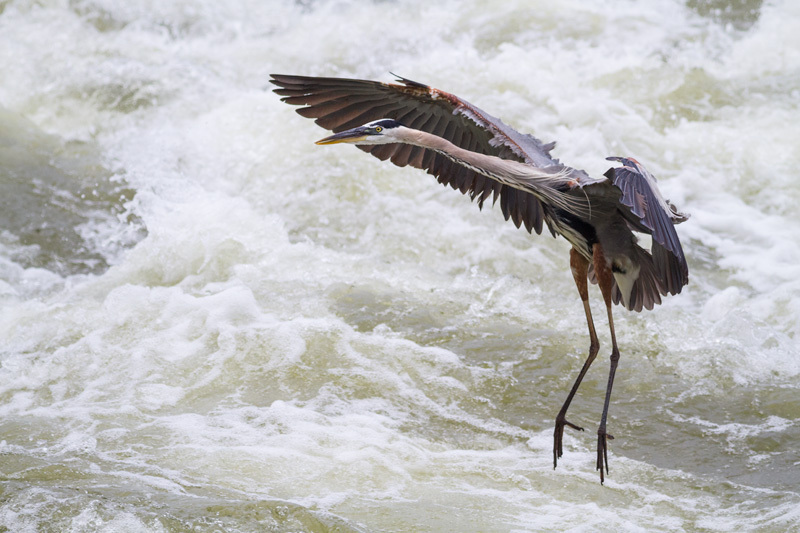 "Landing Formation" - Great blue heron coming in for a landing over the rapids of the Potomac River in Great Falls National Park, Virginia. Techs: Canon 7D, Canon 400 f/5.6. 1/3200, f/5.6., ISO 800.